Climate change will affect precipitation and evaporation patterns and hence the distribution of water below and upon earth surface. In some areas water tables in the subsurface will rise and may result in flooding and increased river runoff, while in others they will decline with water scarcity in both surface and subsurface waters as a consequence. In coastal areas the combination of increasing sea levels and groundwater levels will change the distribution of land and sea as well as freshwater and saltwater. How can we estimate these changes in a sound and proper way, so that we can adapt to and reduce the risks of the climate change effects? To estimate the changes it is necessary to use a combination of results from climate model simulations (“calculations”) and integrated hydrological model simulations, which take into account the distribution of permeable and non-permeable units in the subsurface. Figure 2.1 illustrates the model components of a hydrological model needed for simulatons of integrated effects of climate change. 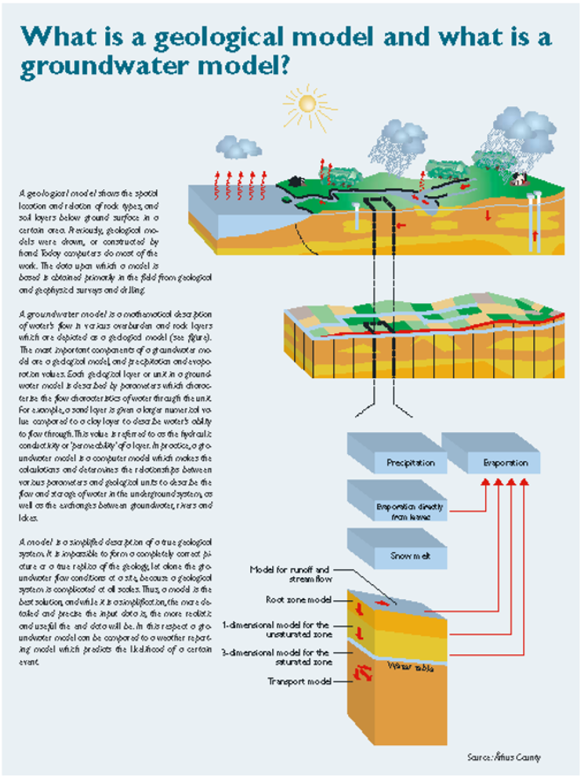 For instance on the distribution of surface and subsurface water and the quantity and quality of the water resources. The methodology applied by the CLIWAT project is to develop integrated geological/geophysical and hydrological models for evaluation and demonstration of the effects of climate change scenarios in selected regions. The models will serve as the main prediction tool in respect of climate induced changes to groundwater quantity and quality. Results will be presented on regional thematic maps for pilot areas (see Figure 2.1). Figure 2.1 What is a model?